Autism Causes .info: Do vaccines cause autism? Vaccines as alleged cause of autism or of the autism increase. There exist two widely contrasting views, both expressed with absolute confidence, on whether vaccines have contributed to causing any autism. On the one hand, many personnel of what is sometimes called the medical establishment absolutely dismiss all possibility of causation of autism by vaccines. The book “Autism’s False Prophets” (Offit, 2008) has been a prominent player in this viewpoint. There are many serious problems with that book, but of relevance to the present question is Dr Offit's statement on page 111 that “even if thimerosal in vaccines accounted for only 1 percent of autism—one in 15,000 children—epidemiological studies would have found it.”. His basis for that conclusion comes from his preceding sentence stating that “Problems caused by vaccines as rare as one in 100,000 have been readily detected by epidemiological studies”. He in turn reckons to have justified that statement with three examples of vaccine adverse effects, namely causation of the rare problems of intussusception, thrombocytopenia, and Guillaine-Barré syndrome, all of which were identified from epidemiological studies. But that reasoning is unsound. Those rare consequences were discernable only because they were (i) definitively diagnosable conditions, and (ii) rare conditions whose occurrence would be readily distinguishable from the background level. By contrast, autism is not only hard to diagnose and impossible to clearly enumerate, but also sufficiently common and widely varying in prevalence of diagnosis that any causation less than a few percent would be impossible to discern among the statistical “noise” variation. It is consequently my opinion that there does not exist sufficiently clear data to justify the extreme position advanced by Offit in those sentences. Meanwhile many thousands of non-professionals are equally absolutely convinced of a concept of “vaccine-damaged children” (by which they mean autistic children), combined with the notion that vaccines have caused a huge increase of autism. One part of what persuades them is the “direct experience” of thousands of parents of so-called “vaccine-damaged” autistic children. We are told that we should respect the testimony of those who have seen the direct experience for themselves. And as there are thousands of them, “therefore” it must be a major cause. But their direct experience is only that their own one or more children became autistic after a vaccine. Their direct experience does not extend to what happened to all the many other autistic children before they became autistic. And this comes in the context that just about all the children were being vaccinated anyway (and at that age), so logically just about all those who became autistic would be expected to have been vaccinated at that age anyway, even if no vaccine-autism causation ever occurred. These “vaccine-blamers” also err in assuming that the clear evidence of a mercury-autism causal link constitutes clear evidence of a thimerosal-autism causation. They err here because they incorrectly dismiss any involvement of mercury from dental amalgam instead (which can easily account for the entire autism increase data). A third, most important, factor underlying the vaccine-blamers’ convictions has been the confusing gradual growth of information about the subject. Most notable in this is this graph in Figure A1 which was presented to the world by Mark Blaxill (2001). Looking at that graph in 2001 one might reasonably have seen it as reasonable grounds to suspect causation of the autism increase by vaccine mercury. A more sophisticated reader might have appreciated that the fall at the end of the autism series was only an artifact of delayed diagnosis, and also appreciated that seven selected years are too few for very firm conclusions. And yet it is still rather suggestive, especially in the context of the Bernard et al. (2001) review which had suggested the plausibility of causation by mercury, and with the lack of any obvious other sharply increasing mercury sources impacting on infants. However, we can now substitute more up-to-date and fuller autism data into Blaxill’s 2001 graph, as follows (and autism has continued to increase even to recent years). A further unsound argument for blaming vaccines was presented by McDonald and Paul (2010). The authors reckoned that they could usefully analyse the autism increase curve by making an approximation of it in terms of two straight lines. They then pointed out that the junction of the two lines, the "changepoint", at which they suggest the autism increase began, was about 1988-9 (i.e. just at the start of Blaxill’s vaccine mercury data). But in reality, just about any curve of roughly exponential increase form can have a couple of straight lines imposed on it such as to passably plausibly account for the entire data set. Especially if you set the time axis long enough so the increase will look like an abrupt event rather than a gradual one. Nice correlations can be found for each line with its corresponding part of the data, and impressively high significance levels pointed out. But it does not follow that the increase is usefully understood in terms of such pairs of lines. McDonald and Paul featured remarkably small graphs of the increase, which tend to give the impression that there was no increase before their "changepoint". And they use a whopping 50-year timespan. It would be better to have larger (taller) graphs around the critical period so we can examine the end of the "level" section more closely. It should be quite obvious from Figure A2 here (and Figures 3, 4 and 6 in the main text) that there was not some abrupt changepoint around 1988-9, and not around any other year either. It is entirely an artifact of their flawed methodology which imposes a “changepoint” on the data whether appropriately or not. In 2011, Safeminds published a rebuttal review of the evidence that was alleged to prove vaccines do not cause autism (Safeminds, 2011). It is important to understand that lack of proof of absence does not constitute proof of presence, and so that rebuttal review does not constitute any sort of proof that vaccines actually do cause any autism. Another popular fallacy is that court judgments constitute evidence or even proof of causation of autism by vaccines. Court judgments are not scientific evidence, but merely non-scientists’ opinions of probability based on the scientific evidence presented as related to the particular cases. There have also been suggestions that the data discussed at the Simpsonwood conference, later radically reformulated into the paper of Verstraeten et al., constitutes glaring proof of vaccine-caused autism. But there were severe methodological deficiencies even in the earlier “generations” of that study. As discussed in the Safeminds (2011) review, there was a very large under-ascertainment and high likelihood of biased selection of cases. And if the findings of 7-fold or even 2-fold relative risk were sound, then one would expect to see that clearly reflected in the Figure A2 herewith, but on the contrary I can’t even see a 1.1-fold bulge there. Some vax-blamers also sometimes cite this study: Hepatitis B triple series vaccine and developmental disability in US children aged 1-9 years. Toxicological and Environmental Chemistry, September 2008, Carolyn Gallagher and Melody Goodman. Part of the problem with the vaccine-autism theorists is that they keep jumping between theories. At first it was the triple MMR to blame, then it became mercury-containing vaccines, then a combination of both, and then again maybe it was Hib or Hep-B. In reality there's scant real evidence that any of these have caused the increase (which was well underway long before 1989 and the increase just carried on rather than changed in some way at that point).. In conclusion, neither of the strongly asserted positions are justified by the evidence. There is no good evidence that vaccine mercury never causes autism, and yet neither is there any good, publicly-visible clear proof that it has caused any autism. And it certainly did not cause the autism increase. And that increase is meanwhile easily and fully accountable for in terms of the changeover to non-gamma-2 dental amalgams from 1976. 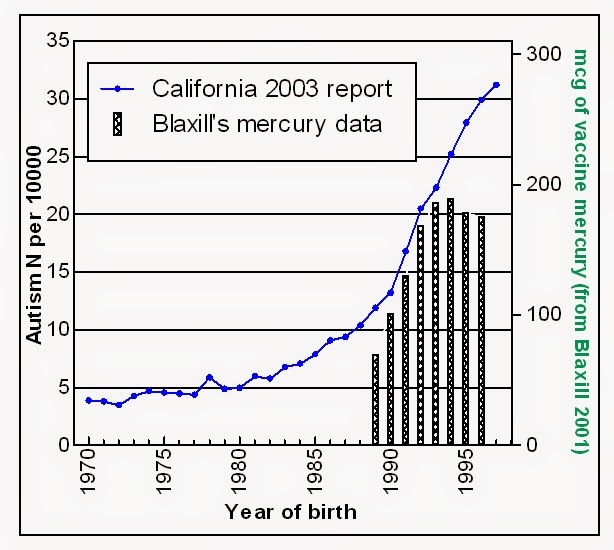 Blaxill M: Rising incidence of autism: association with Thimerosal. In: Institute of Medicine. Thimerosal-containing vaccines and neurodevelopmental disorders. Washington DC: National Academy Press; 2001:49–50. Bernard S, Enayati A, Redwood L, Roger H, Binstock T: Autism: a novel form of mercury poisoning. Med Hypoth 2001, 56:462-471. Offit PA: Autism’s false prophets. Columbia University Press; 2008. Safeminds: Vaccines and autism – what do epidemiological studies really tell us? 2011. I hold a uniquely "privileged" position of lack of bias in relation to this dispute. I have no personal connection whatsoever with autism, with no family or friends affected by autism. As a thus consistently independently-based researcher there is no pressure on me to go along with any particular institutional position. My only connection with autism is that many years ago I discovered and later published the uniquely unchallenged, comprehensive, theory of autism, long before there was any talk of an increase let alone the slightest linking of it with vaccines or even mercury. Furthermore, autism is just one of my numerous great theories, so I am not here gripped by all-eggs-in-one-basket ego syndrome either. From this background, I and the antiinnatia theory really don't give a hoot as to whether or not any vaccine causes autism. We will just follow the facts wherever they lead us. Some people--generally sloppy media people--are claiming there has been an increase of about 500 times; their "increase" numbers there are indeed inflated by ignoring that the earlier numbers were of "autism" while the later ones were of "ASD" in general. But meanwhile the numbers diagnosed with more strictly-defined "autism" have also seemingly increased. I haven't discussed that increase on this website because I present my discussion of the question in my (forthcoming) update review itself. Various bits of evidence lead me to conclude therein that there certainly has been an increase of about tenfold. Even establishment people such as Irva Hertz-Picciotto now accept the reality of an increase. That change of ratio cannot be explained away as due to diagnosis or awareness. Meanwhile there's a "huge backlog" of diagnoses right now in the UK, as Polley Tommey video linked up top here explains - that it is taking up to nine years to get a diagnosis because the official system is swamped (....by this imaginary increase?). And meanwhile Fragile X cases have become about a ten times smaller part of the whole. Why would that be? An obvious answer is that other causes have increased tenfold. Your theory of how genes and environment interact is an interesting and credible one. Is it possible you could expand on it evidentially? Or perhaps even work up a publishable study of it? Some of the groups interested in environmental factors could be interested in chasing up the concept.